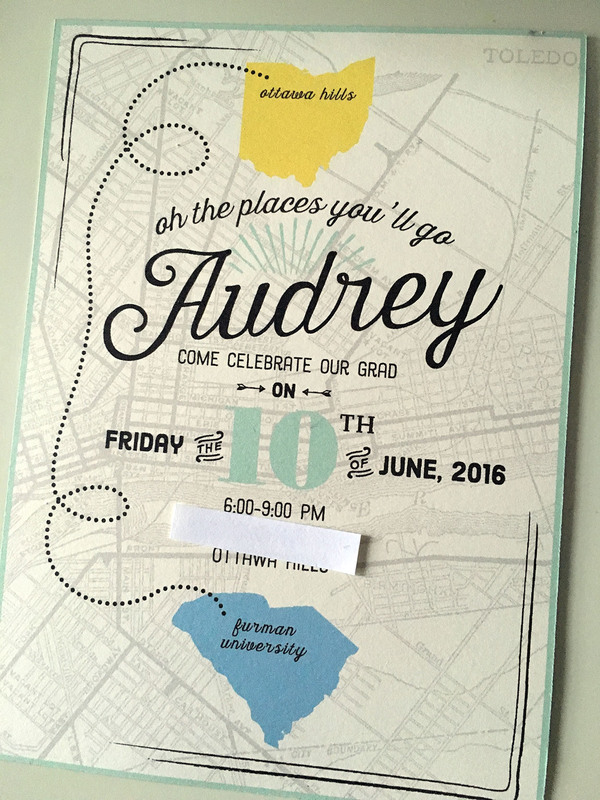 I’m so excited to FINALLY share with you the details of Audrey’s graduation party! 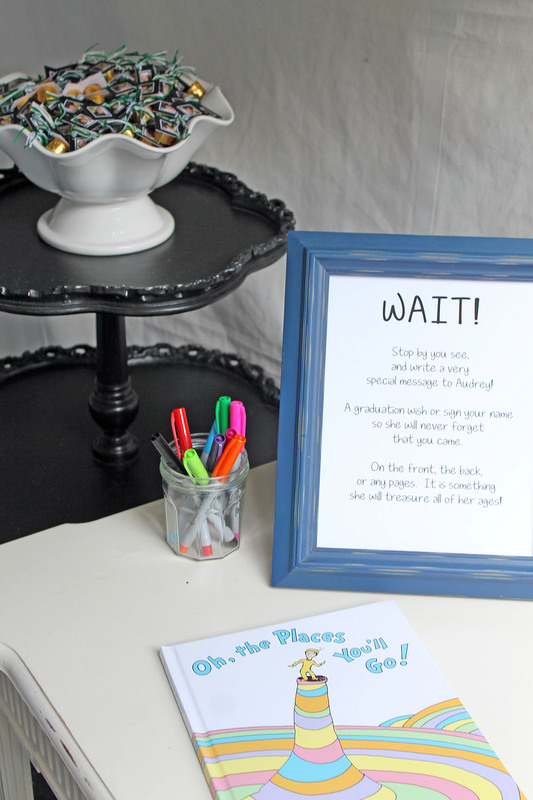 We decided to plan the party based on the theme of “Oh, the Places You’ll Go.” It was a perfect mix of the Dr. Suess children’s book combined with vintage travel decor. 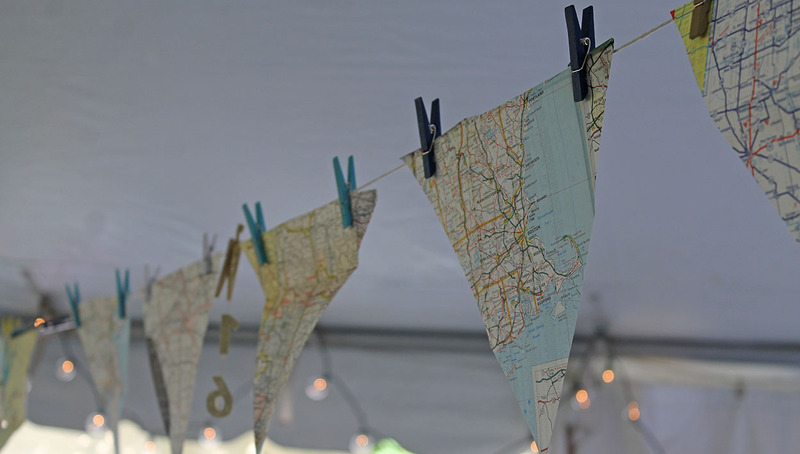 I felt this was perfect for my daughter, given that she loves to travel and explore new places. 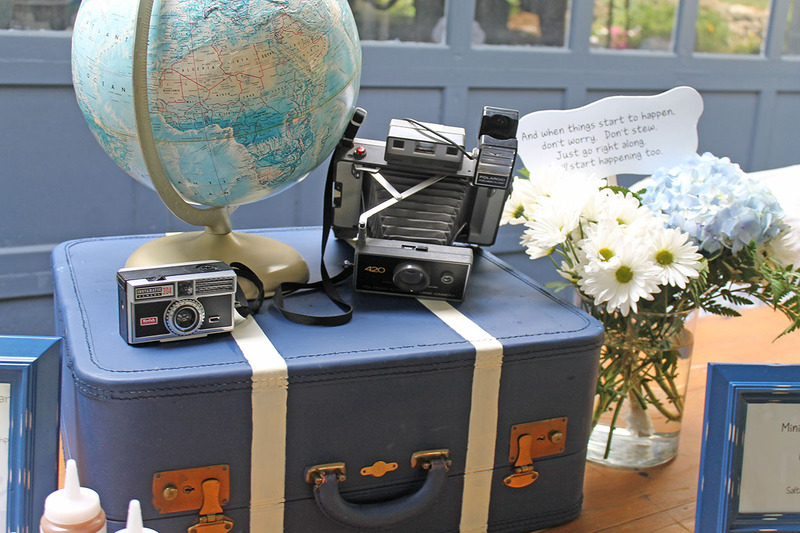 With the travel theme in mind, I began scouring the local antique shops and craft stores for globes, maps, suitcases, and cameras. 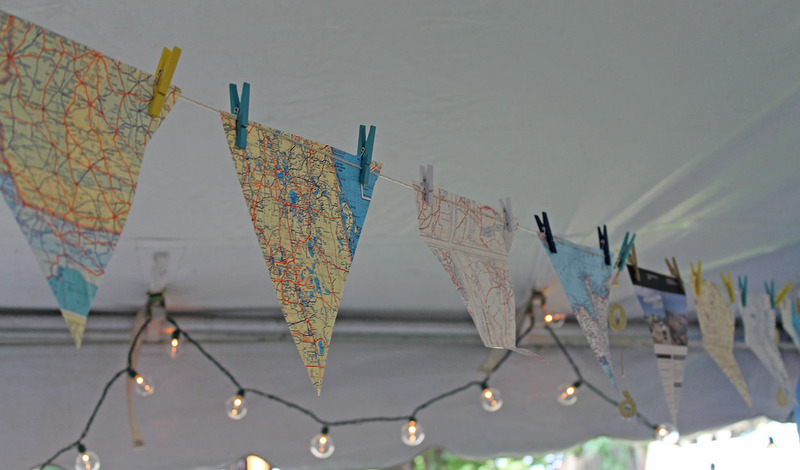 I lucked into some fabulous finds to use for table decorations. 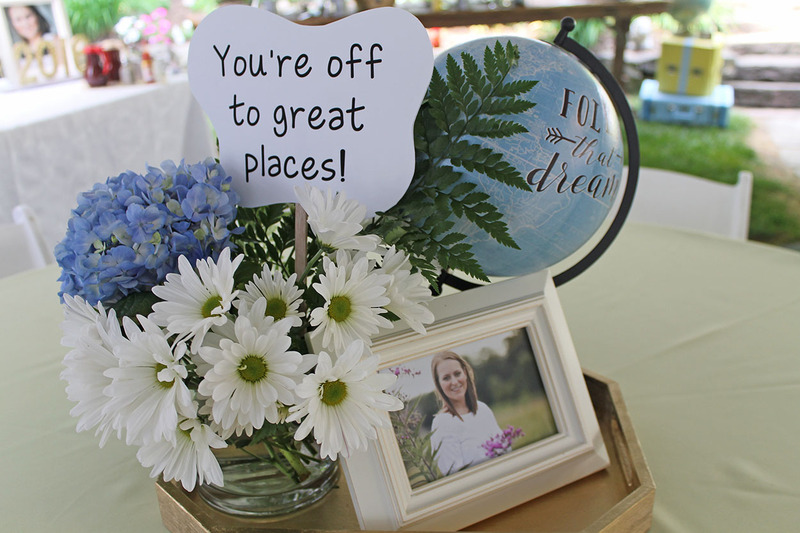 I painted wood trays with gold metallic paint, and I used those as the bases for the centerpiece arrangements on each of the round tables that was used for guest seating. 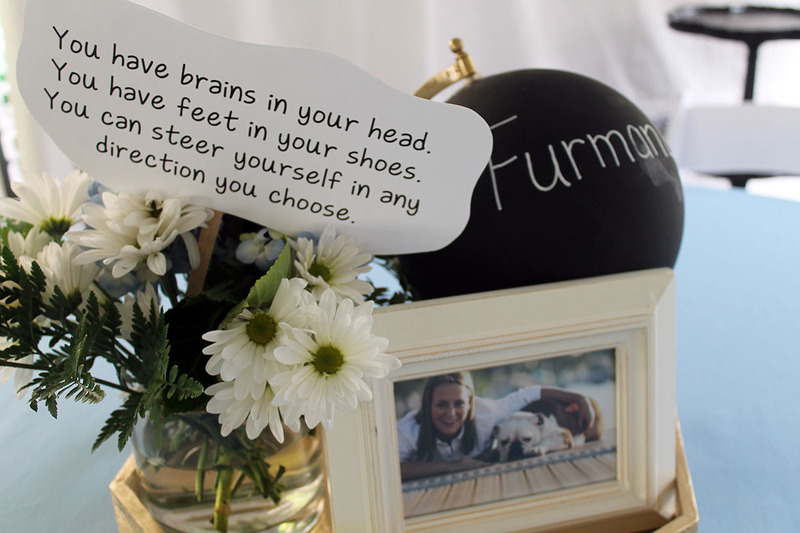 Along with the globes, I added a framed senior photo of the graduate to each tray. 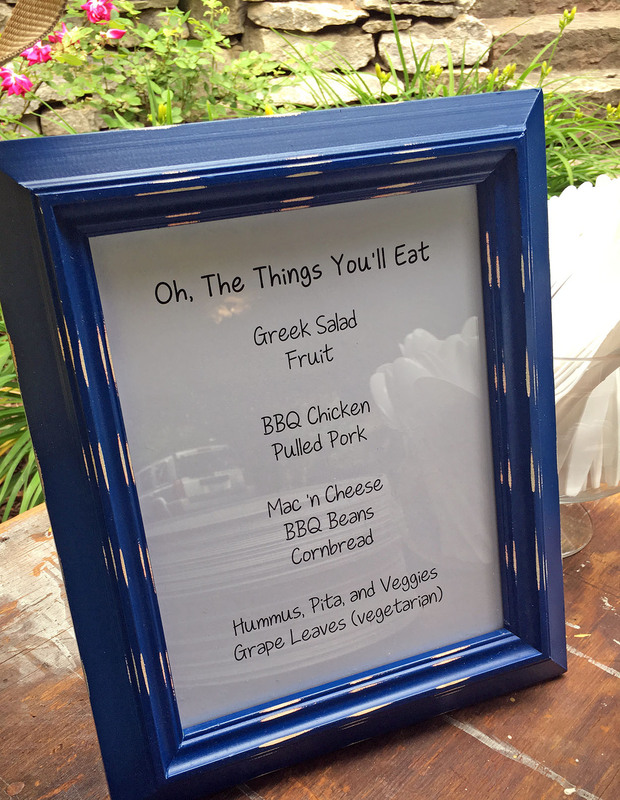 The finishing touch was a vase of white daisies and blue hydrangeas. 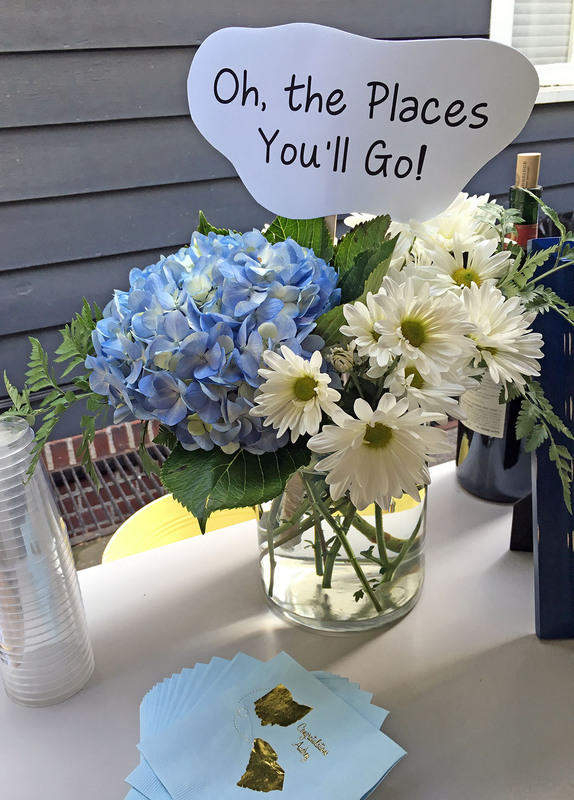 I added quotes from the Dr. Suess book to each vase, for a whimsical touch. 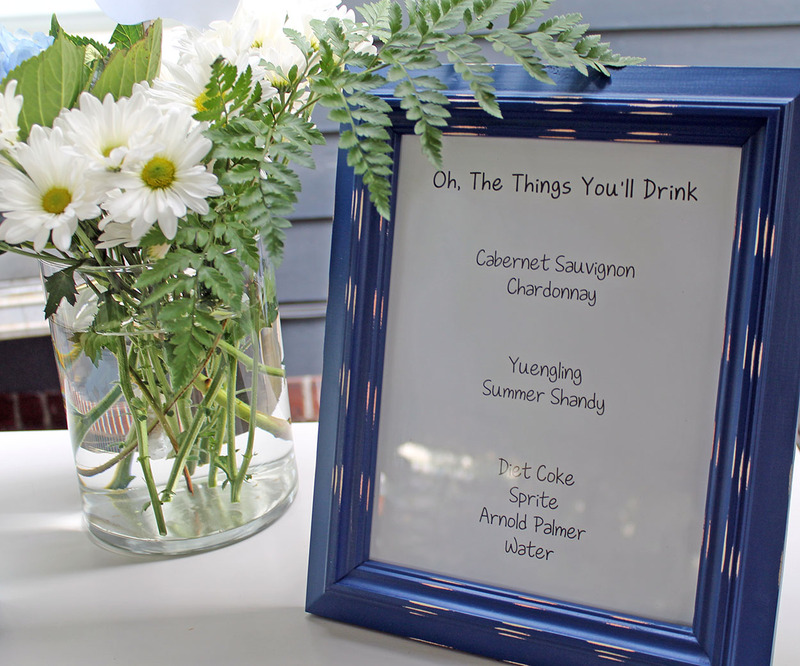 The vases of flowers with the quotes were also scattered on the bar and buffet tables. 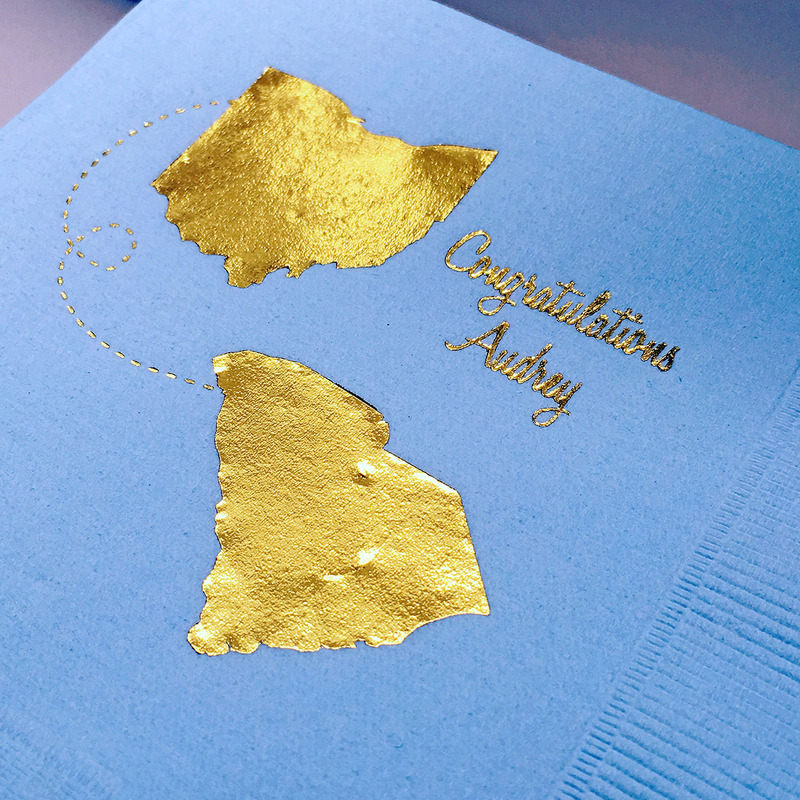 I adored these fun napkins that showed the PLACE she is going! 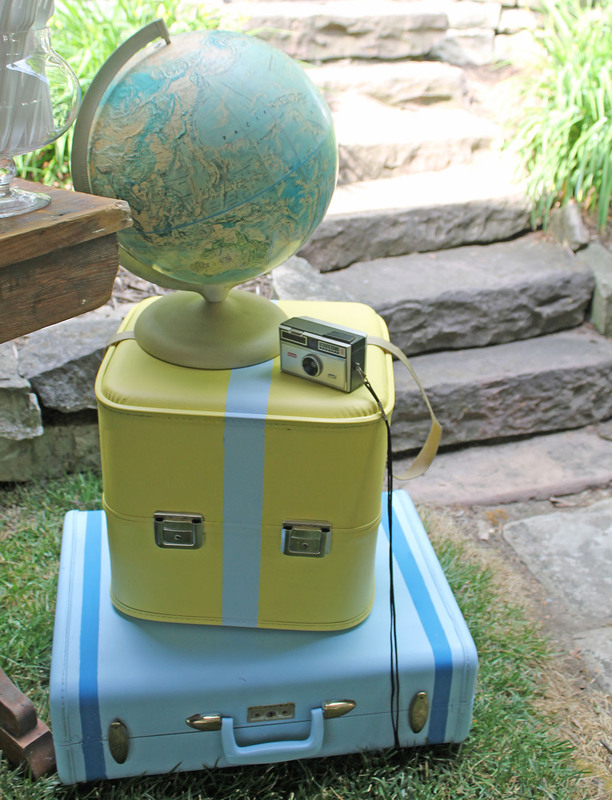 The buffet tables were decorated with more globes, old suitcases that I painted to coordinate, and vintage cameras. 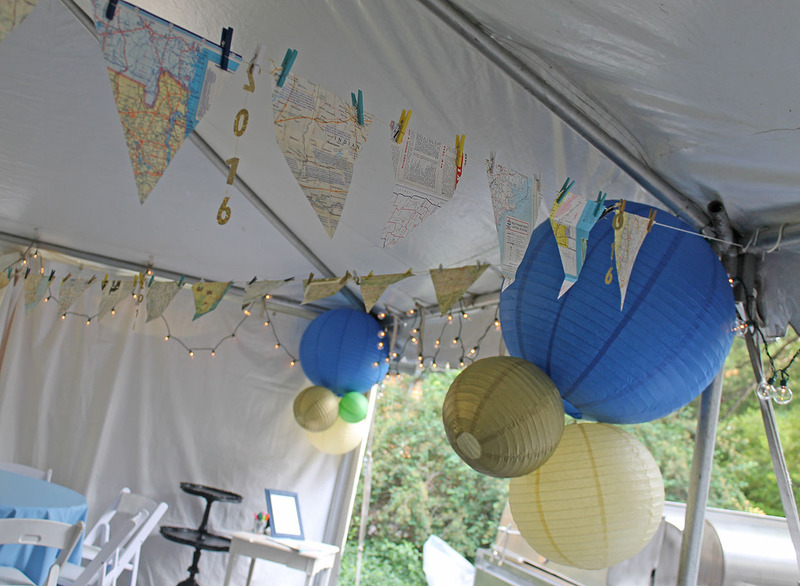 The tent was decorated with banners made from the vintage maps, white string lights, and paper lanterns in blue, green, yellow, and metallic gold. 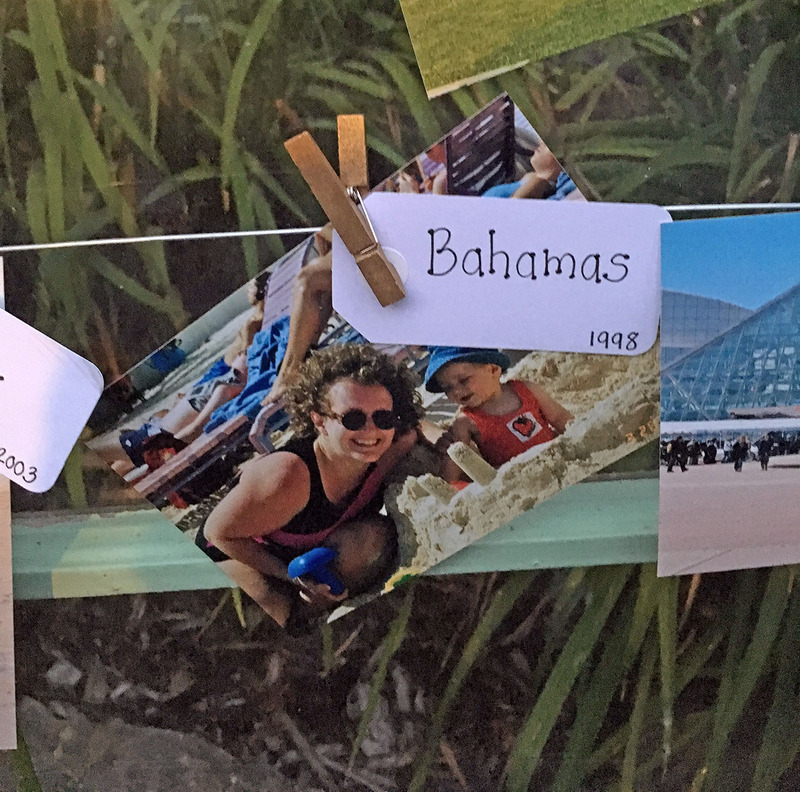 I was thrilled to find so many maps of places where my daughter had actually traveled…Florida, the East Coast, California, Arizona, France, China. 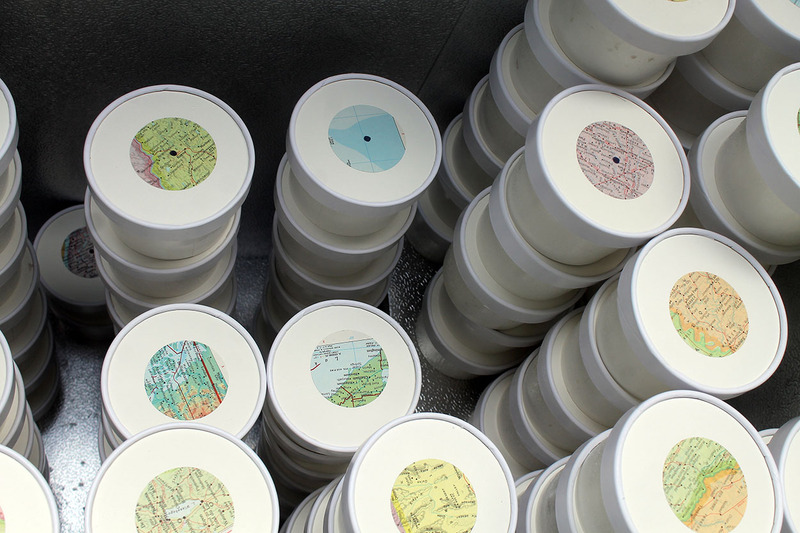 And of course I found a map of ‘where she’ll be going’…South Carolina! 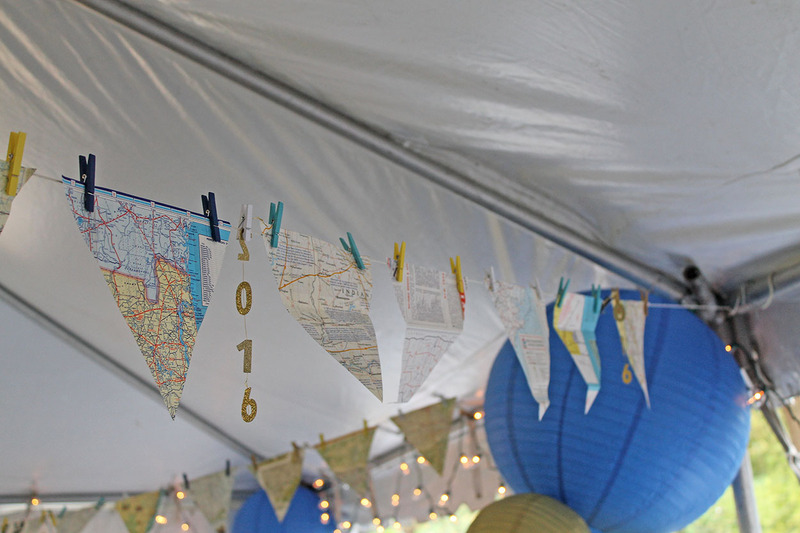 She loved the map banners so much that she is taking a few pieces of them to hang in her freshman dorm room. 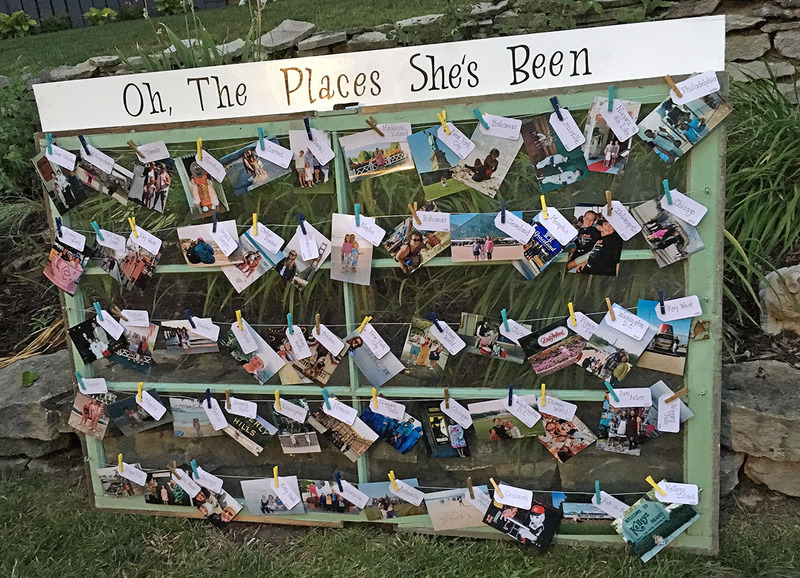 Another decoration of the party was this picture collage that I created titled “Oh, The Places She’s Been.” I found this old window frame from a 1929 school house at a local antique shop, and I used it as the backdrop for the collage. 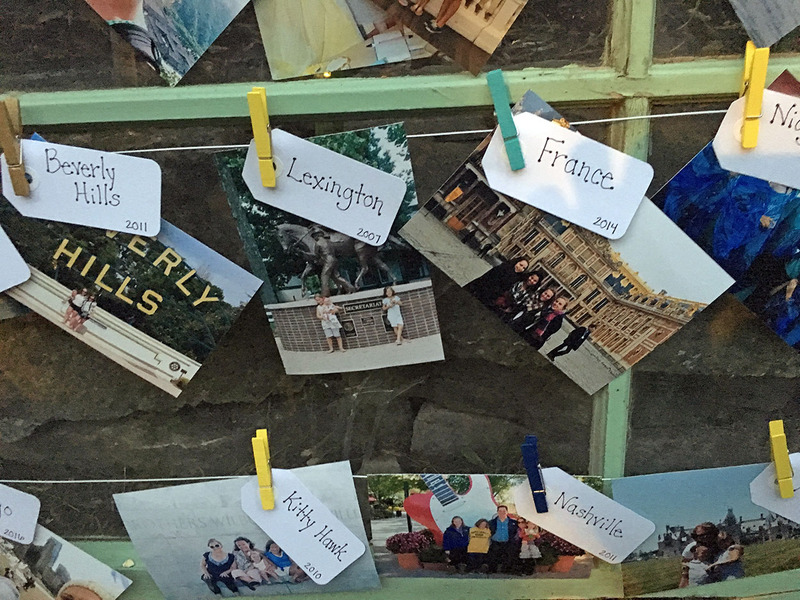 I dug through pictures to find photos to represent places to which she has traveled throughout her life so far. 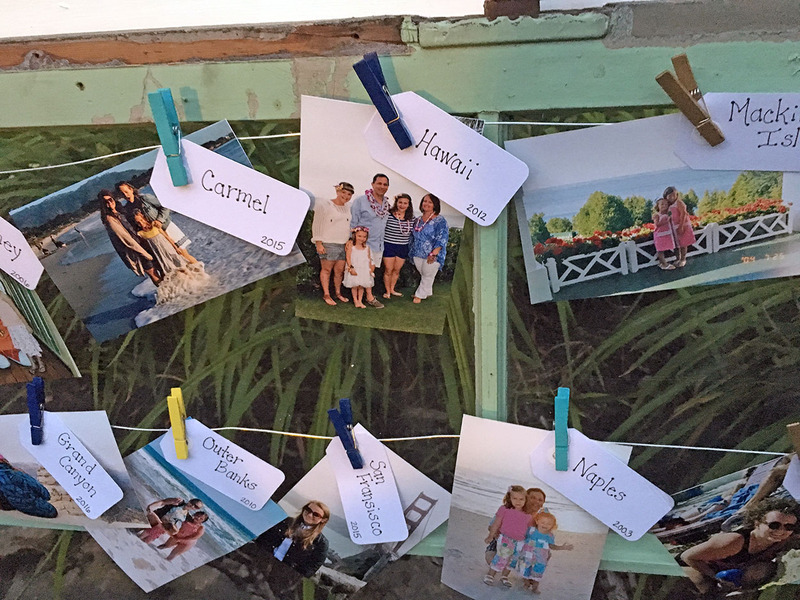 Wire was attached to the window frame, and the pictures were clipped to the wire with mini clothespins. 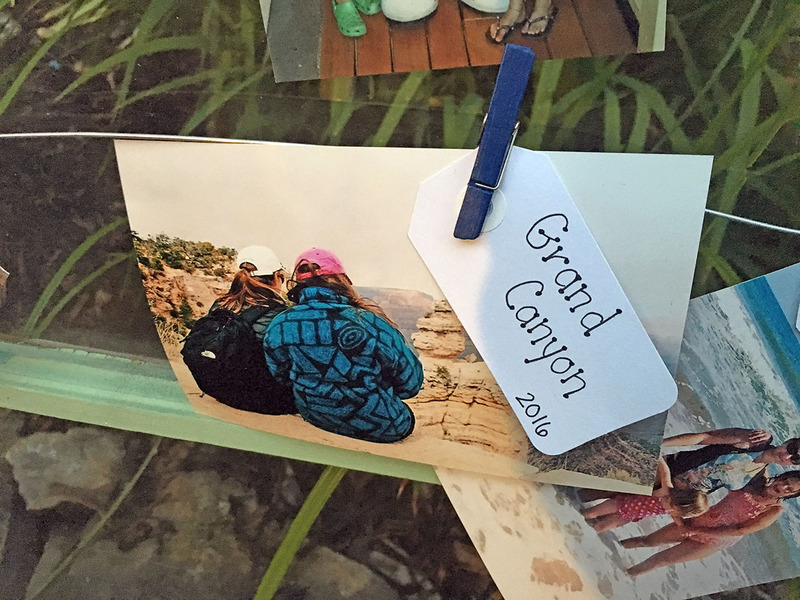 From her first vacation, the Bahamas as a sixth month old, to her most recent trip to the Grand Canyon AND most every travel in between! 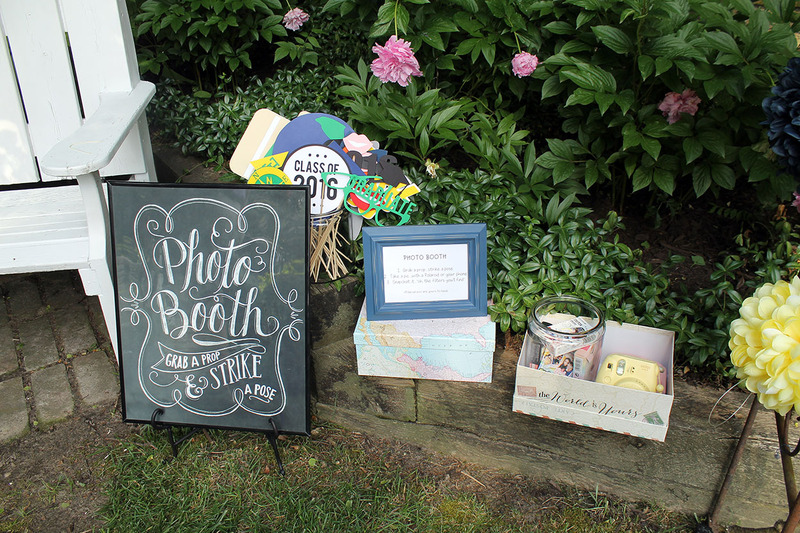 Speaking of pictures, there was an opportunity for our guests to capture some memories during the party with the photo booth that I created. 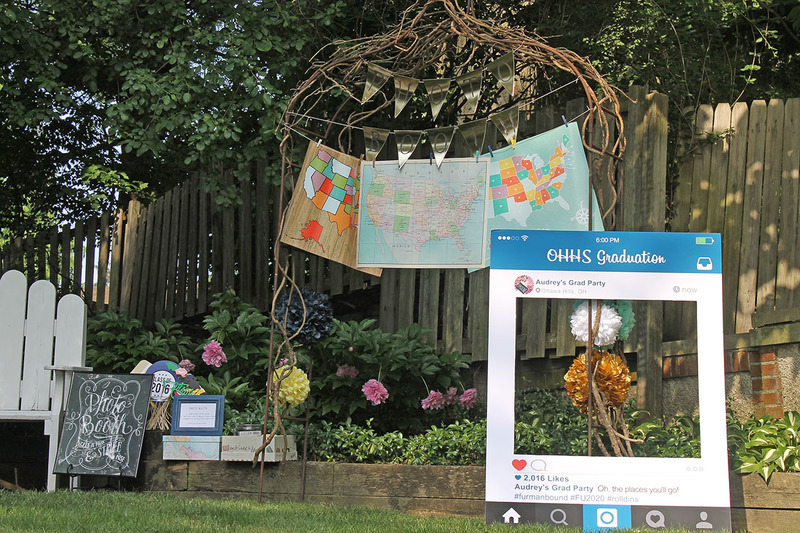 More banners, maps, and photo props set the scene for those pictures to be shared on Instagram and Snapchat. 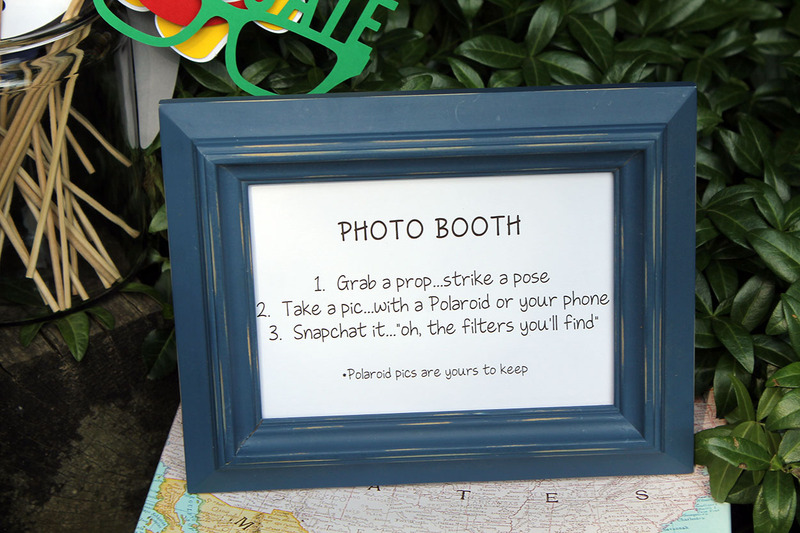 Polaroid cameras allowed the younger set to take a memory home with them, also. 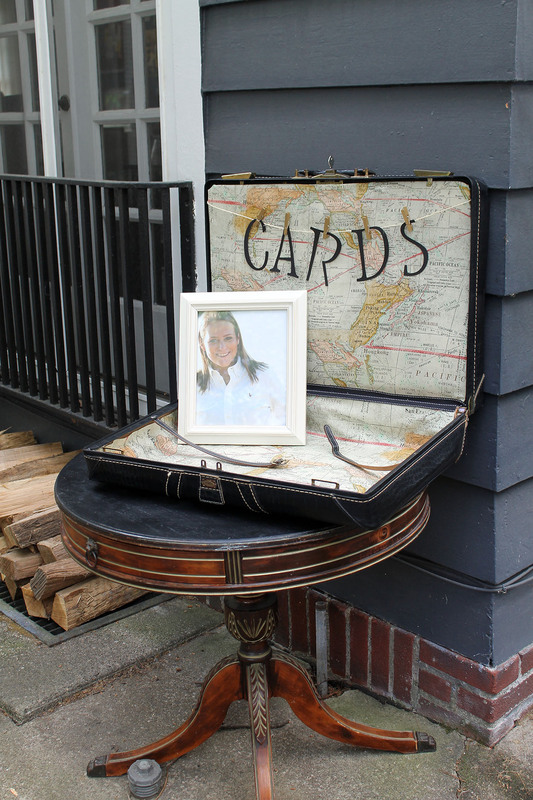 A few other details included the use of another vintage suitcase that I lined with old world map fabric…it was used to collect cards and gifts for the graduate. 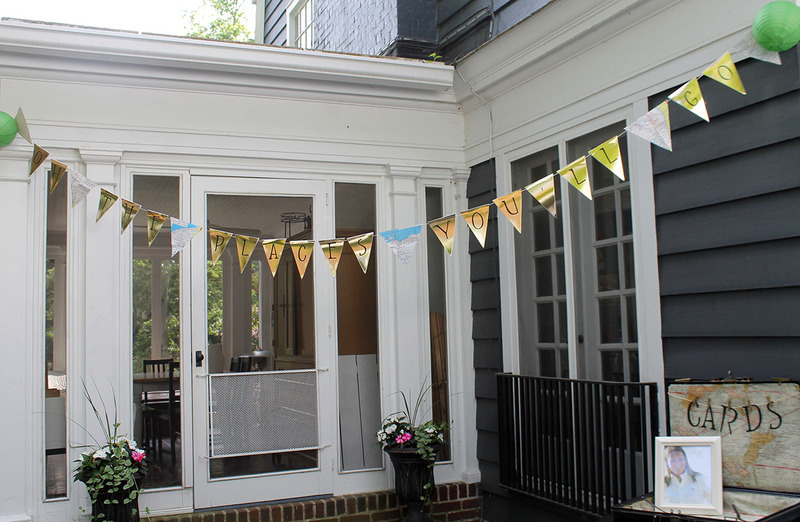 Another banner was hung just above it…just in case you didn’t know the theme of the party by now! Did I mention this was going to be a LONG post?!? 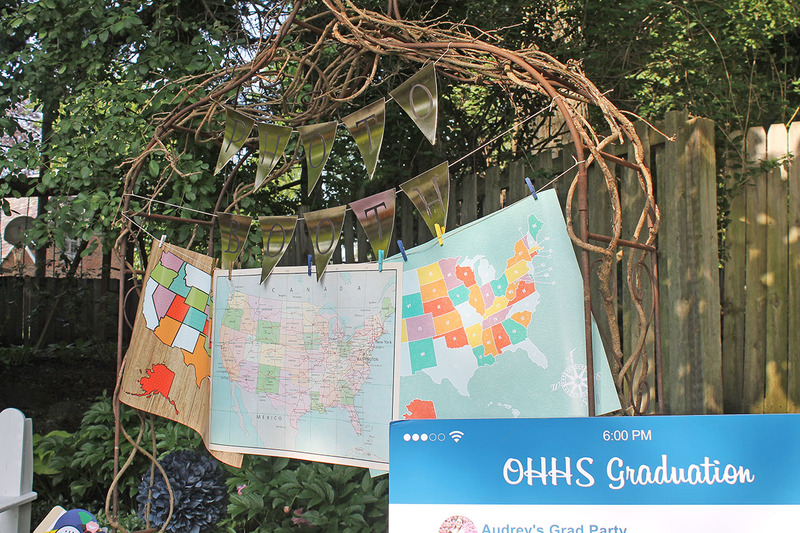 Thanks for sticking with me and reading about all the planning that went into this party…I am almost finished! 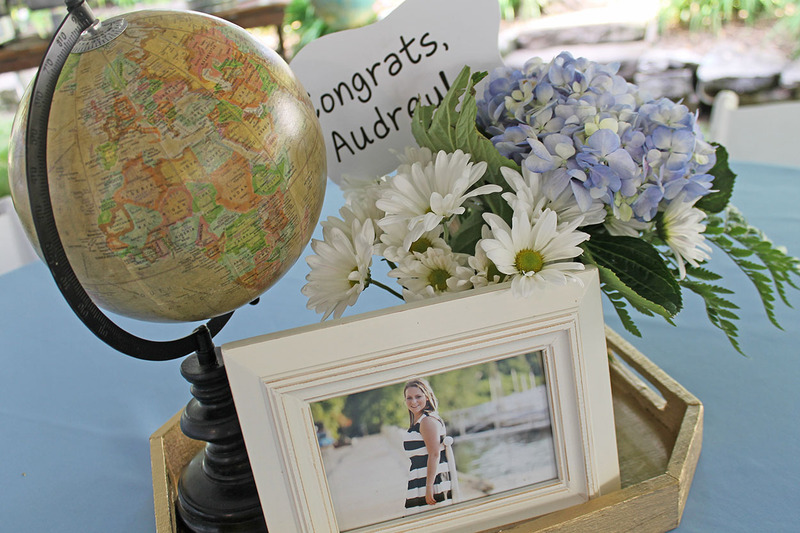 As the guests left, they were invited to sign or write a short note for Audrey in the book. I know she will treasure those messages! 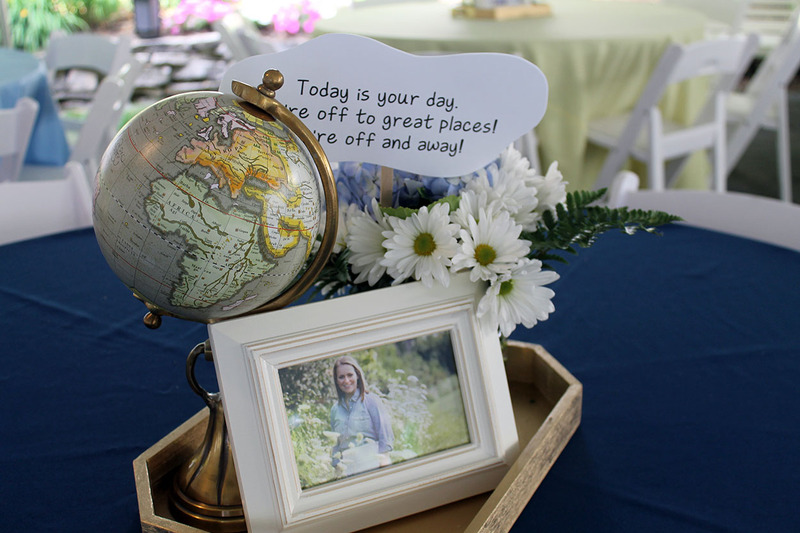 It really was a fun party to plan, and I’m so excited to see all the places she’ll be going in her life! 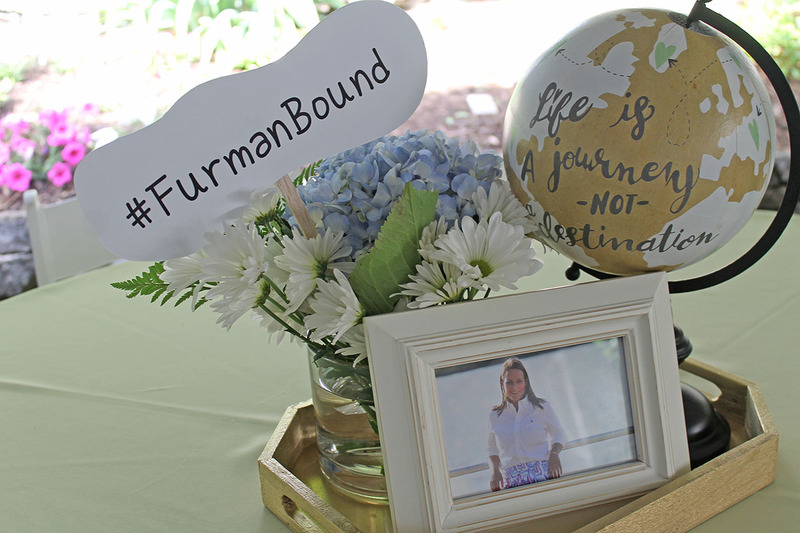 I know the next destination…college at Furman University! 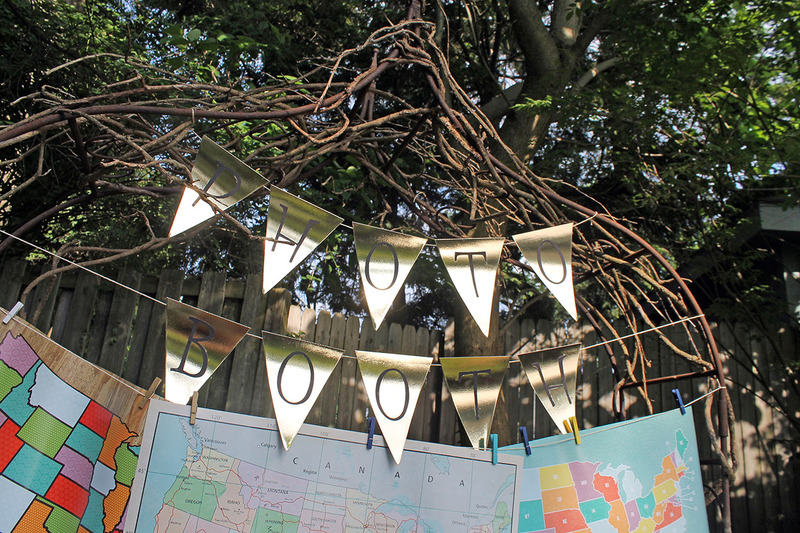 You put so much work and thought into the party, and it paid off. Everyone had a great time! 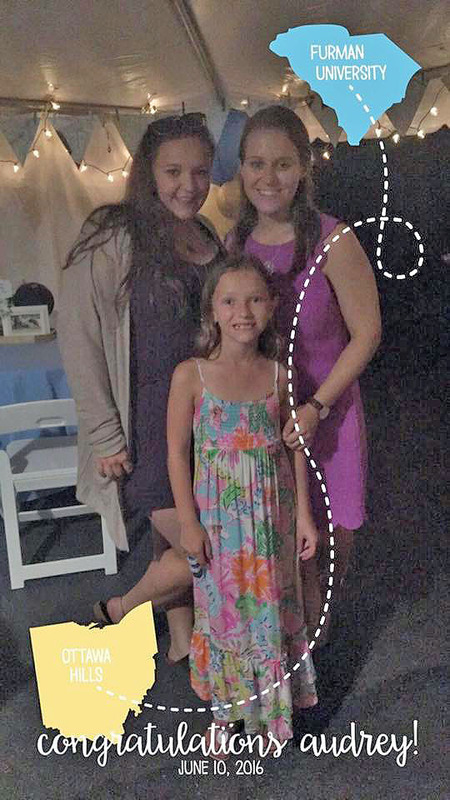 So glad you could celebrate with us! 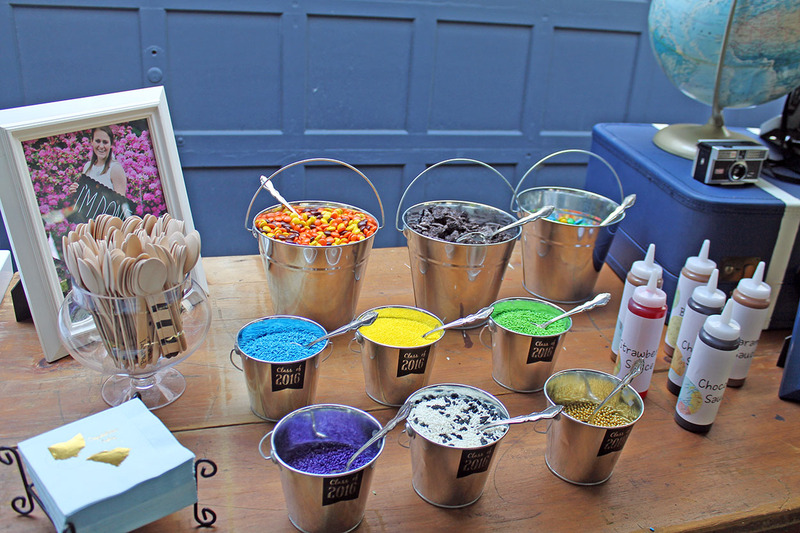 It was a beautiful party! I’m so sorry we missed the book on the way out! 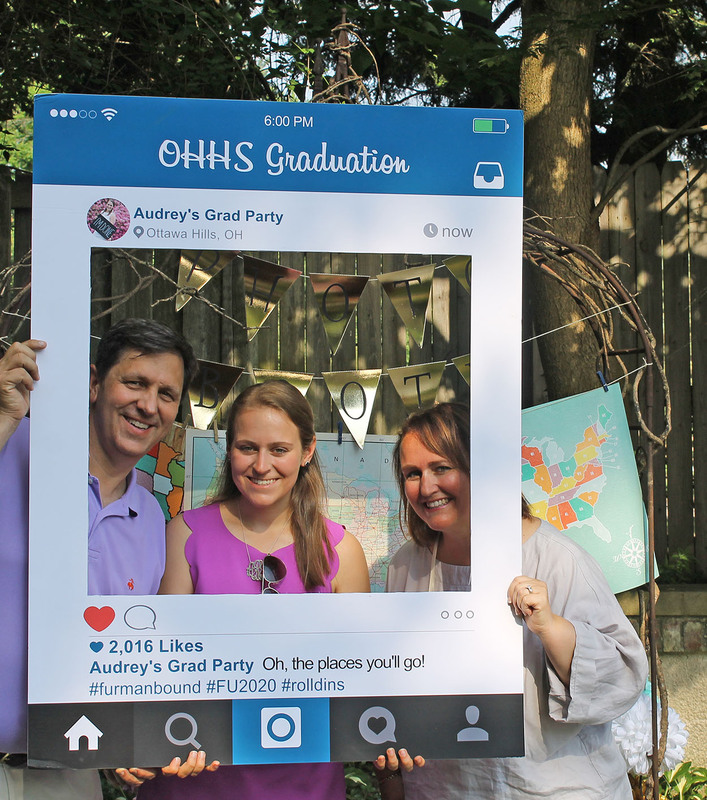 Continued congratulations on your amazing daughter and such a blog-able event! 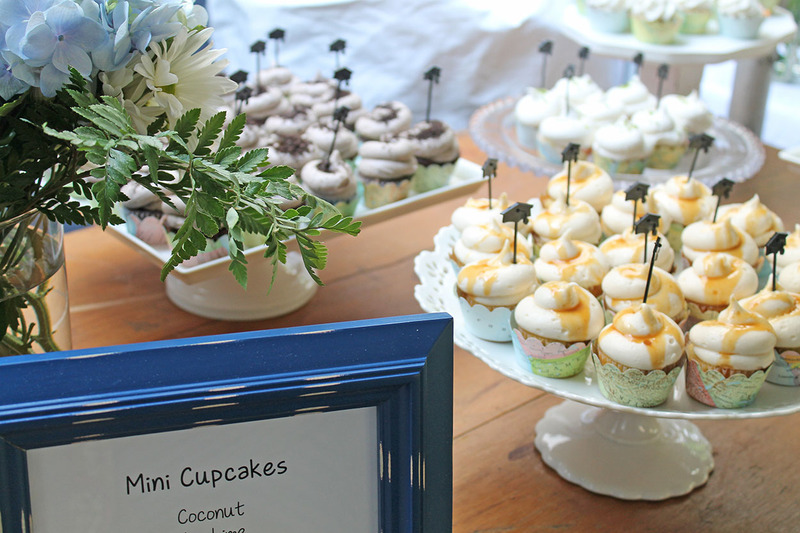 Thank you, Carol…so glad you could celebrate with us! Our daughters have exciting times ahead!